BBC Radio 4 - Drama, Lena Marsh, Live and Shticking! Lena Marsh (Rebecca Front) is the self-proclaimed Broad of Broadway. Now in her 90th decade she is in London to record a new christmas album, with the help of Michael Ball. She's Big, She's Brash, She's Still Breathing and She's Here! Lena Marsh (Rebecca Front) is the self-proclaimed, 'Broad of Broadway'. 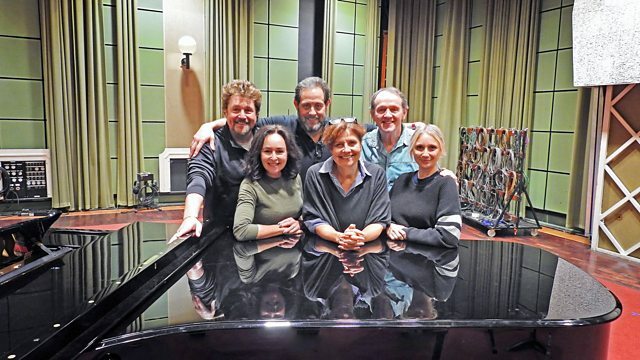 Now in her 90th decade she's in London to record a new christmas album at the BBC, with the help of her showbiz chums including the legend that is Michael Ball, Olivier Award-winning musical sensation Sharon D Clarke and Kevin Whately ('Lewis' in Inspector Morse and it's spin-off series 'Lewis'). With a son and daughter who both want their mother dead, what could possibly go wrong in this festive action comedy - full of surprises and twists - from the team behind hit Radio 4 comedy, Incredible Women. With guest cameos from Michael Ball, Kevin Whately and Sharon D Clarke and a top-notch comedy cast including Bafta-winning Rebecca Front, Samantha Spiro, Jeremy Front, Jenny Bede, Jason Forbes, Lewis Macleod, expect candid conversation, surprise revelations and hilarious action as Incredible Women's Jeremy Front raises the red velvet curtain on Lena Marsh - Live and Shticking!